Permissibility of import and export goods, is governed by the nomenclature, ITC (HS) classification of Import and export of goods published by the Directorate General of Foreign Trade (DGFT), in this nomenclature, goods are arranged. They are arranged as they are in the Harmonised System (HS) but are codified by ten digit numerical code to Identity goods with more precision for purposes of import/export control. 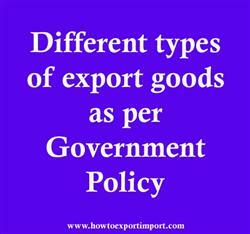 All goods other than the entries in the export licensing schedule along with its appendices are freely exportable. The free exportability is however subject to any other taw tor the time being in force. Goods not listed in the Schedule are deserted to be freely exportable without conditions under the Foreign Trade (Development and Regulations) and Regulations) Act, 1992 and the rules, notifications and other public notices and circulars issued thereunder from time to time. Goods listed as "Frees in the Export Licensing Schedule may also be exported without an export license as such but they are subject to conditions laid out against the respective entry. The fulfilment of these conditions can be checked by authorized officers in the course of export. (a) Prohibited Goods: Prohibited items are not permitted to be exported. An export licence will not be given in the normal course for goods in the prohibited category. Some of the prohibited items of exports are all forms of wild animals, exotic birds, beef, sea shells, human skeleton, peacock feathers, etc. (b) Restricted Goods: The restricted items can be permitted for export under licence. The procedures/conditions wherever specified against the restricted items may be required to be complied with, in addition to the general requirement of licence in all cases of restricted items. (c) State Trading Enterprises: Export through State Trading Enterprises STE(s) is permitted without an Export Licence through designated STEs only as mentioned against an item and is subject to conditions of EXIM Policy. (d) Restrictions on Countries of Export: Export to Iraq is subject to conditions as specified in Exim Policy and other conditions which may be listed in the title ITC (HS) Classification of Export and Import items. Tax wrongfully collected and paid to Central Government or Union territory Government.